Brilliant and bittersweet nostalgia piece with well drawn characters and plenty of funny and heartfelt moments. Lucas's most personal and emotionally authentic work. Brilliant. Good storyline that could never be remade in a later era. American Graffitti is by far the best car guy moive every made. Nearly everything was right on the money. You know a film captures the hearts and minds of the movie-goes public when no one in Hollywood will even attempt to make a simular film for fear of not getting close to living up to the original. The lost cast member in the group is Paul LaMat. Ironically, he was perhaps the best of the entire cast. the great movie for tennagers for all time! The movie was way ahead of its time and if was in the movies today opening it would be no.1 with out a doubt. The cars are the main stay but the actors were every much a part of it, compared to the young actors of today they are in a class all their own. Took me back to the late 50`s early 60`s. Probably the best ever period to be a teenager. If only I could time travel back. American Graffitti is the best car guy film I have ever seen, growing up in Long Island NY in the late 70`s cruising and street racing was alive and well !!!!!!!!!! not this Fast & Furious BULL C--P !!!!!!!!! I saw the movie when It first came out and was able to share in it a few years later. I long for another real car movie. I doubt it will ever happen! 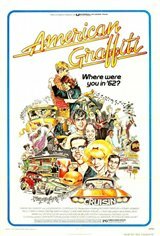 I thought AMERICAN GRAFFITTI was an excellent movie. I was 16 when it was released, and could relate to some of the experiences of the people in the movie. Also, it showed a lot of the things to consider before leaving home for the first time. I thoroughly enjoyed the movie, and would highly recommend it to young people leaving home for the first time. One of the best movies i´ve ever seen!